Can I admit that I'm a pretty antsy flier? I feel like I'm constrained to my seat & can never seem to get comfortable - no matter how short or long the flight is. Forget trying to sleep on a flight - this is something I've never mastered and wish more than anything that I was the type of person that could easily fall asleep anywhere. Our flight to Iceland is about 5 hours long and overnight so I'd love to be somewhat rested when we arrive since we have tickets to go straight to the Blue Lagoon. So before I get into my in flight essentials - I'd love to know if you have any tricks for sleeping on a flight, specifically for those flights over 4 hours! I scooped this strawberry lip balm up while I was refilling some of the items I'd run out of at Sephora earlier this week. I don't like to wear lipstick on flights, but lip balm is a must! Also a must, hand santizer - I instantly become a germaphobe when I travel! Eye drops for when we land and my eyes are red! I learned my lesson after getting about 3 hours of sleep on an 13 hour flight to Dubai!! For overnight flights I brush my teeth before we take off - trying to trick my body into thinking it's night time and I'm ready for sleep, however it never works! I do pack Colgate wisps with me as well for a little refresh when we land! Evian Mist Spray || I've said it before & I will continue to say it over and over again - this spray is the best at giving you a little refresh. Whether you're going someplace warm or cold - this is great for giving your skin a little extra hydration after truly drying flights. There is a deal going on at Nordstrom right now - a 6 pack for $21 - that makes each can about $3.50...it's usually that price for a 3 pack! We have these noise cancelling headphones that I purchased for us before one of our last international flights. I also pack silicone putty earplugs. I don't travel without them anymore because they do an amazing job of blocking sound out and we always use them in hotels since the walls tend to be very thin! I pre-load my iPad with a couple of episodes of my current favorite show from Netflix - I've been watching Hart of Dixie and also a movie that G & I haven't seen so we can watch something together if we're both not sleeping! I also have this book that I'm reading right now and a handful of magazines I've been saving for the flight! Tech Organizer || I bought this tech organizer for Gary a few Christmases ago and we use it on every single trip! We pack extra headphones, our waterproof phone pouch, outlet converter & apple wires. Collapsible Water Bottle || I'm sure most of you have a water bottle that you fill up after we get through security. This is my first time using a collapsible water bottle so that I can have a bit more space in my carry on and just fold it back up when we land! Blanket Scarf || One of the best gifts last year that my sister got me was this blanket scarf - I like to use this instead of the blanket they give you on overnight flights. However if the blanket looks to be good quality - we've never flown Icelandair before, then I'll use my blanket scarf as my pillow because I just can't use a neck pillow - they do nothing for me! Paper Items || This might be pretty old school for some people since everything is on our phones now, but I like to have all of our tickets, hotel confirmations and any tours that we have already pre-booked printed out. You just never know if your phone decides it doesn't want to turn on or maybe the data package is kaput! I just started using these folders for our couples getting married and decided to use this for our trip as well, gotta love multipurpose items! And, can't forget a pen for filling out customs forms! Snacks, snacks & more snacks || I actually had the "shots, shots, shots, shots" song in my head but with snacks 😂 For anyone that doesn't know my husband - he's hungry all the time! I usually pack enough snacks on the plane to feed a growing child! What are some of your in flight essentials? Do you have any sleep tips for flights? I'm the same way when I fly. I always feel uncomfortable and can never get settled. These are great essentials -- I feel like I need those ear cancelling headphones before our next trip. I hope you can sleep on the overnight flight! I have the toughest time sleeping on planes!! 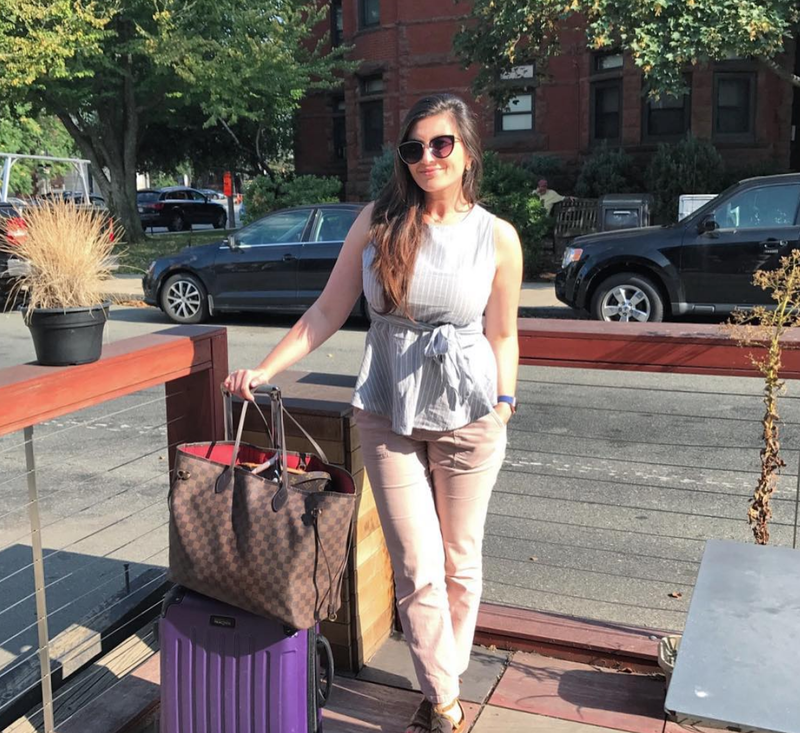 My husband is out the minute he sits down, These are great travel essentials to make the trip more comfy! I always have my favorite reading material, a jacket/sweatshirt, water, and socks, too. And I hate to say it, but it's so easy for me to sleep on a flight! It's the noise of the air that puts me out and I can sleep an entire flight haha! I hope you're able to get some rest on your way to Iceland! That water bottle is so handy! I always buy a water after security, but I should reall start bringing a water bottle like that! I wish I had some tips for you to fall asleep! Great post Biana! That collapsible water bottle is so cool! I need to get one of those for my entire family. It's perfect for any trip because it saves space! Ugh sleeping on the plane is so hard. I had a red eye with J last month and I just couldn't get comfortable. Even sleeping on his shoulder lol. I had a lot of the essentials you just mentioned plus an eye mask! A lavender weighted one! It did help a little bit. I have been pouring over bluetooth headphones trying to figure out which ones to get. I need to look into those! Love these recommendations and put the tech organizer in my Amazon cart for my husband for Christmas because he travels a lot overseas. A suggestion might be compression socks for long flights . . . several people I know wear those when flying to prevent issues. Kinda boring suggestion but not a bad idea! I love seeing what people's travel essentials are! We just got back from a trip to Iceland and flew Icelandair. They have a ton of movies/TV/music to choose from - they've got blankets and pillows and their service was amazing. Iceland was beautiful - I hope you guys have a great time! I am a VERY anxious flier and it's something I really hate about myself because in the past it has deterred me from going certain places! So many of these are my essentials too! Especially the noise-cancelling headphones and the lip balm. My whole face gets SO dried out on a flight! That folder is genius and I need to get it and the tech organizer before our next flight. I only used to fly red eyes on purpose because I think they pass by faster. I try to limit caffeine that day and bring half of a tylenol pm to help me sleep (and because I am a big baby and my ears always hurt on planes.) I didn't realize Iceland was only five hours! That's going to be the best trip! Girl you nailed it on the head. I, like you, am an anxious flier and worry about not having everything I need/want right then. I keep a little pouch with my nail clippers [for hang nails, i'm not that person], chapstick, LOTION, earplugs, spare headphones, hair things, bobby pins. And of course snacks on snacks on water! Wow that fold up water bottle is genius!! I can get antsy when I travel/fly too. Especially when there's a delay. My husband and I call it travel purgatory because you just want to get where you're going to and there's so much waiting! The noise canceling headphones are going to be clutch! I'm the worst at sleeping on planes and always end up being the one with their light on reading or watching a movie. A glass of wine definitely helps make me sleepy if I'm flying! That collapsable water bottle is so cool! I always pack a big one and it's a bit cumbersome! 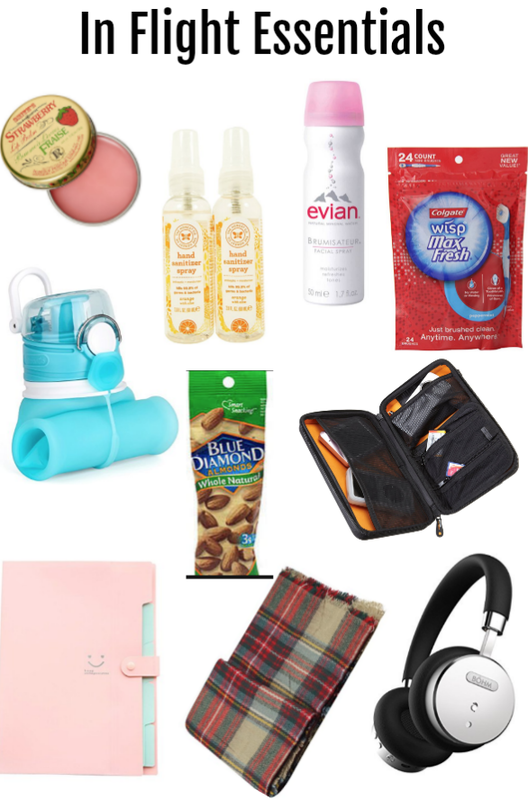 These are all great plane essentials! I found some noise canceling headphones on amazon, and they were game changers. I think it’s hard to sleep on the plane, too! Tylenol PM usually helps me, but 5 hours isn't THAT long by the time you factor in takeoff and landing... so your best bet may just be a double shot of espresso when you land! Heck--I'm sure you'll be running on excitement and adrenaline-- so jealous that your first stop is the blue lagoon!!! I LOATHEEEEEE flying so for me, I need something for my nerves, so I'm always bringing coloring book & markers. Keep my hands & mind busy. Snacks snacks snacks, everybody! That is in my head now, lol. I have never seen a collapsible water bottle before, I think I need that! I have not been on a super long flight since I went to Europe in 2003, I forgot how antsy that feeling was! I take Tylenol PM right before the flight and that helps me sleep for a bit but not much. I also bring lots of water, as I get so thirsty on a plane. I find that being hydrated helps with the jet lag. As for snacks, I always bring a ton of with me. However, I was once on a plane where they made an announcement that the flight would be nut free because someone on the flight had an allergy. Since, all my snacks were not nut free, I couldn't eat any of them. So, now I bring stuff that is nut free as well. So my advice is to bring some snacks that are nut free just in case. I can't sleep on a plane either so I'm interested to see if anyone else has any tips! The collapsable water bottle is such a good idea, and I'm like Gary and need a million snacks! I hope you have fun on your trip! I can't really sleep on a plane either. I would say trying some of the NyQuil sleeping pills! That might work for you! It's all about entertainment and snacks! I also bring along earplugs for the air pressure. That collapsible water bottle is THE BEST idea!! I always have eye drops and extra solution to take out my contacts when I fly - the air is so dry! Sorry that you can't sleep on planes. I think from taking public transport to work I've actually gotten used to sleeping at all times and in all places, so now I can sleep on planes. And I totally agree with you about being prepared for anything and having paper copies of everything! Chris is the exact same way, and we always have paper copies on big trips. I'm with you on flying. The older I get the more I hate it. And I've never once slept on a plane... not even when we were on the ten hour flight red-eye back from Hawaii. It was MISERY. Every single person on the whole flight was asleep except for me. Haha. And yes, good noise canceling headphones are a MUST. We have some Bose ones and they are excellent! You guys are going to have so much fun! And I can't believe the flight to Iceland is only 5 hours!! I need to look at it on the map to see exactly where it is becuase I thought it would be longer than that! I've got to have my reading bits and yes to headphone with me with of course some nibbles. No one wants to get bored on a flight! Ha!! Nice post here. All perfect for a relaxing flight. Even better that it's over night so you can get some rest and hopefully not feel too jet lagged when you arrive. I always bring my neck pillow and a small blanket since the plane is usually so cold. The headphones are a great idea for cancelling out any noise so you can rest up. So exciting! Im not the best flyer either! Snacks are a must and same with lip balm! My lips always get so dry on flights! I always have to have water and a few snacks! For some reason, sitting on a plane just makes me want to eat. Such a cute post! Love all your picks! I hate flying and try to avoid it as much as possible. I love all your ideas. That strawberry lip balm is so good. Chris has a ton of those tech organizers. So brilliant! Ohhhh so many great essentials here. I need to check out that Collapsible Water Bottle how smart is that?!?!? If I'm going to sleep on a flight, I have to take something. That means like half a dramamine if I want to sleep for four hours. Eekk! Have a great trip, I had a chance to go to Iceland several years ago but it was cancelled. Blanket scarves are amazing and can be used in so many ways! I LOVE that Evian spray thanks to you- such good stuff! I cannot fly without my noise cancelling headphones. I juts need them all of the time with me! Awesome tips and some great reminders!! I have a hungry husband too--snacks are a necessity! Iceland is definitely on my places to visit, but that overnight flight would be hard for me to sleep through too! Add an eye mask. I pop some melatonin or magnesium as soon as I board an overnight flight, pop on an eye mask, and just try to rest... I try and wake myself up at a "normal hour" for the time zone I'm going to and watch movies and stay away until landing. When I land, I get outside (fresh air beats jet lag), have a good dinner, and go to bed early... you have to resist the nap monster!